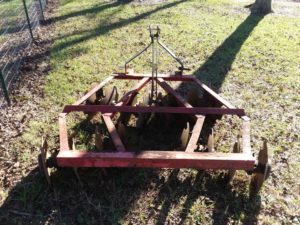 5-foot Disc for Fergie – Acquired from Ed Turner of Citronelle 10/28/2018, with the 2-bottom plow, in exchange for the four old augers. Disc blade spacing: 7-1/2 in. The construction is held together by cast iron bearings and 1 inch axles. Due to this smaller size, this 5 ft. disc harrow also matches quick hitch compatibility.